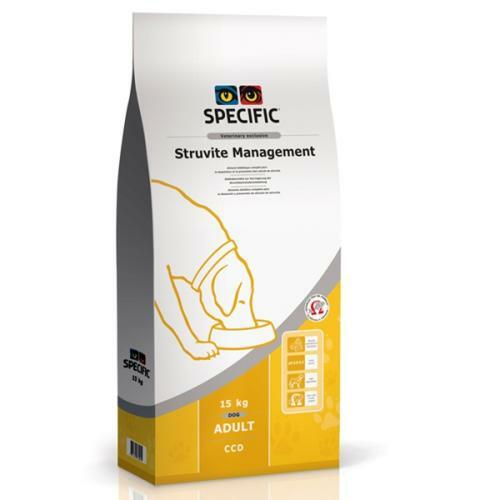 Specific CCD Struvite Management Adult Dog Food is a delicious and specialised formula that's designed to help dissolve struvite bladder stones and reduce the risk of new ones forming. Makes your dog’s urine more acidic helping dissolve struvite stones. Maize starch, wheat, maize protein, pork fat, maize, eggs, fish meal, minerals, potato protein, hydrolysed poultry protein, powdered cellulose, vitamins and trace elements, methionine, rice, fish oil, psyllium husk. Antioxidants: EC approved additives: BHA, BHT, propyl gallate. It contains no artificial colours or flavourings.